VLC media player VLC - bu aksariyat media kodek va formatlarni chala oladigan kuchli media ijrochisidir. VLMC VideoLAN Movie Creator - bu video fayllar yasash va taxrir qilish ilovasidir. DVBlast DVBlast - bu sodda, biroq kuchli MPEG-2/TS demultiplikatsiya va striming qilish ilovasidir. multicat Multicat - bu ko'pkanalli strimlarni oson va samaralli ravishda boshqarishga mo'ljallangan ilovalar to'plamidir. x264 x264 - bu videolarni H.264/MPEG-4 AVC formatga kodlovchi bepul ilovadir. Barcha xarajatlarimiz foydalanuvchilar tomonidan qilingan xayriya mablag‘lari evaziga qoplanadi. Agar siz ham VideoLAN dasturini yoqtirsangiz, iltimos, bizni qo‘llab-quvvatlash uchun xayriya qiling. VideoLAN bu ochiq kodli dasturiy ta'minot. Bu shuni anglatadiki, agar sizda ham biror mahsulotimizni yaxshilashga oid tajriba va xohish bo‘lsa, marhamat, bizga qo‘shiling. Bizning fikrimizcha, VideoLAN eng yaxshi narxda, ya’ni bepul tarqatiluvchi eng yaxshi video pleyerdir. Agar siz ham bu fikrga qo‘shilsangiz, iltimos ushbu dastur haqida do‘stlaringizga ham xabar qiling. VideoLAN is publishing today, VLC 3.0.13 on Android and Android TV. This release fixes numerous issues from the 3.0.x branch and improves stability. VideoLAN is publishing today, VLC 3.1.0 on iOS and on Windows App (WinRT) platforms. This release brings hardware encoding and ChromeCast on those 2 mobile platforms. It also updates the libvlc to 3.0.3 in those platforms. 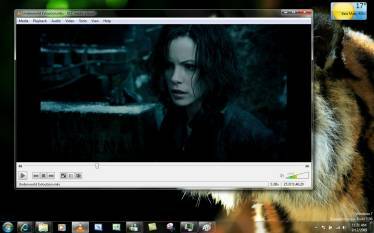 VideoLAN is publishing the VLC 3.0.3 release, a new minor release of 3.0. This release is fixing numerous crashes and regressions from VLC 3.0.0, "Vetinari", and it fixes some security issues More information available here. VideoLAN is publishing the VLC 3.0.2 release, for general availability. This release is fixing most of the important bugs and regressions from VLC 3.0.0, "Vetinari", and improves decoding speed on macOS. More than 150 bugs were fixed since the 3.0.0 release. More information available here. VideoLAN and the VLC development team are releasing VLC 3.0.1, the first bugfix release of the "Vetinari" branch, for Linux, Windows and macOS. This version improves the chromecast support, hardware decoding, adaptive streaming, and fixes many bugs or crashes encountered in the 3.0.0 version. In total more than 30 issues have been fixed, on all platforms. More information available here.